Halema'uma'u is the sacred home of Pele, Hawai'ian Goddess of Fire. The flowers and fruits in the foreground are offerings to the goddess. 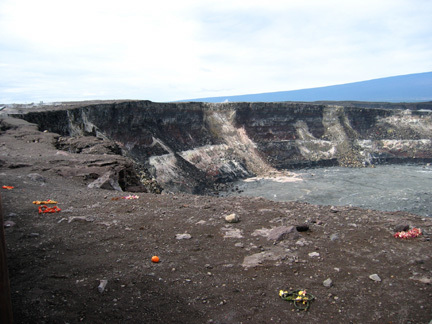 The last eruption within the crater was in 1982. You can see that the steep walls have begun to collapse into the crater in the background.